Ready to make passive income online? You’re not alone! Earning while you sleep is the dream of many. But how do you continually add to your bank account 24/7/365 if you have no clue how to start? The answer depends on you! Even if you’ve never made a single dollar online, you can definitely get into the passive income game. It’s just a matter of playing to your strengths and finding the right revenue stream(s) for you. Whether you’re a creative maker or a right-brain thinker, there are beginner-friendly ways to make passive income online. In fact, you don’t even need to be a so-called expert to teach others. As long as you have knowledge to share, whether it’s about knitting, resume writing, networking, or wine tasting, you can package it into a course! To explore the idea of earning passive income as a course creator, head on over to Teachable. This is an easy-to-use platform solopreneurs often turn to when they’re ready to make and sell a professional course online. 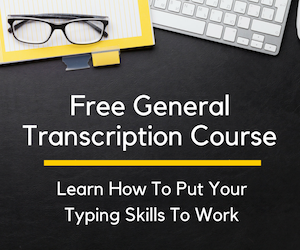 On top of the free and paid-for options to create, Teachable sets you up for success with plenty of helpful guides, webinars, and tutorials. Even their blog is packed with articles that cover everything a beginner will need to go from course idea to course creation in as little as 20 minutes a day. You may not realize it, but stock photos are everywhere. When you visit a website, look at ads, read a magazine, or browse a brochure, chances are there’s a stock photo or two (or 20) being used. Bloggers, business owners, and marketers turn to large photo marketplaces whenever they need an image to help tell their story. Because of this high-demand, online photo marketplaces constantly need new images to add to their lineup. That’s where you come in. And, before you even ask — you don’t need to be a pro-photographer to make passive income online with photo sites! In fact, if you have a smartphone, you can use images right in your phone’s gallery. One great image can sell over and over again earning steady income month after month. Each stock photo site will have different terms. But, more often than not, you can offer as many images for sale as you’d like. Each time one of your snaps sells, you get a commission. It’s really that simple. Like creating a course, you can also write an ebook without being a so-called expert. In fact, you can write a non-fiction ebook in just 30 days. If you’d like to exercise your creative writing chops, you can go the fiction route. But, keep in mind, it often takes much longer to pen a fiction ebook than a non-fiction one! To turn an ebook into passive income, it all starts with an idea. Maybe you want to put together a recipe book filled with crockpot recipes for one. Perhaps there’s personal branding advice you’ve been dying to share with the masses. 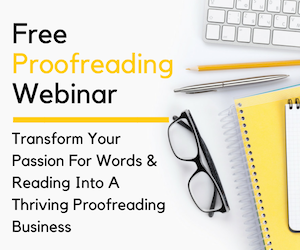 Whatever your knowledge, passion, or hobby, chances are you can capture it into a well thought out ebook. Not only is Amazon the Mecca of online retailers, it’s a popular platform to buy and sell ebooks. Because of it’s popularity, many ebook authors use Amazon Kindle Direct Publishing (KDP) to get their words in front of millions of online shoppers. Amazon KDP walks you through each of the steps it takes to format and upload your book for sale. The percentage you’ll earn on each purchase depends on the price of your book. Books priced between $2.99-$9.99 earn the highest royalty rate of 70%. You can also choose to enroll your book in Amazon’s Kindle Unlimited program. Kindle Unlimited allows subscribers to read as many ebooks as they’d like each month for one low fee. If your book is enrolled in this program, you’ll earn for each page that is read. Royalties earned from KDP are made once a month, and can be direct deposited to your bank account. Another popular place to sell your ebook is called Gumroad. While this platform isn’t as large as Amazon, there’s still plenty of potential to bring in passive income. Once your ebook is for sale, you can easily promote it with direct links to Twitter and Facebook. Plus, there are built-in tools that help you build an audience and email list, which can result in a loyal following that equals more sales. What I like about Gumroad is the option to set your book price as “pay what you want.” That is, buyers can pay what they feel is a fair rate for your ebook, whether that’s $1 or $100. Whatever your price point, payments are made once a week — every Friday! You won’t get rich with referral programs, but they are super easy ways to make passive income online. Your cell phone provider, apps you use, online retailers, and even your bank may have a referral program. For example, Capital One has a referral program for its account holders who refer new customers. Whenever someone uses your link to sign up for a new account, you’ll receive 50 bucks deposited into your account. But that’s just one example of the many referral programs out there that can help you make passive income online. Curious if companies you currently use have refer-a-friend programs? 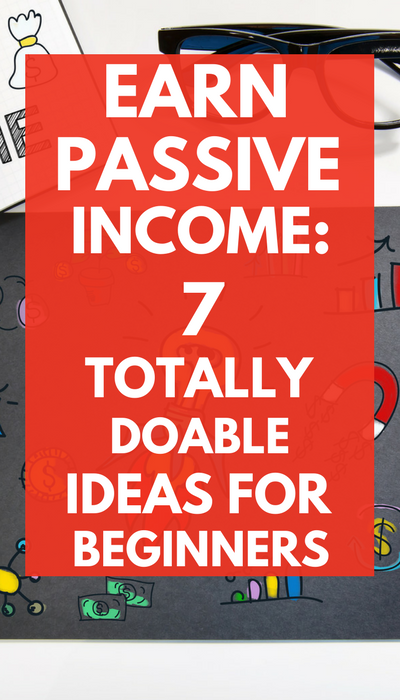 Check out this list for more than 40+ popular programs that can lead to passive income. Some online stores keep physical inventory on hand, which means lots of packing, shipping, and returns — not exactly passive. When you eliminate physical products and opt for digital goods, you can create an e-commerce passive income machine. When it comes to selling digital downloads on autopilot, you can get super creative. Sewing patterns, greeting cards, templates, coloring pages, invitations and printables can all be created ahead of time and delivered digitally to customers. And, like the other options listed, you can make a digital item once and sell it many times over. One of the easiest ways to make passive income online with digital products is with Shopify. This popular e-commerce platform makes it easy to get digital downloads up for sale thanks to its intuitive website builder and apps that allow you to sell around the clock without having to be anywhere near a computer. Their help center is brimming with the best advice from experienced sellers as well as helpful tutorials that’ll make it easy to get your shop open. Go ahead and give it a try for free and see just how easy it is to create this passive income revenue stream! Can you cook? Play the guitar? Use Photoshop like a pro? Whatever your talent, you can record yourself or your computer screen and turn those videos into a passive income YouTube channel. Granted, it takes time to develop a following. But if you focus on quality content, your audience will follow. Screencast software, like Camtasia, can help you create professional tutorials for anything computer related whether it’s a how-to video for setting up a website or a step-by-step guide to mastering Photoshop. If you prefer to be front and center, you can easily do that too with a decent webcam and microphone. Product reviews, cooking demos, makeup how-tos are great videos to share with an online audience. But, again, feel free to get creative and use your unique talents to broadcast valuable videos to the world. Some of the most popular YouTube channels involve health, finance, fitness, and food. But, really, you’re only limited by what you’re able to do. Because you can use affiliate marketing and advertisements to monetize your YouTube Channel, that can translate into some pretty impressive passive income month after month — all for recording a video once but getting paid over and over again. A video made a year ago, can still earn impressive revenue today! Some YouTube stars can make millions (yes, millions) each year off of their channels. The amount you make in passive income will depend on the number of viewers and types of advertisers. SocialBlade has a handy calculator you can use to project your passive earnings based on audience size and video views. Once your channel gets large enough, you may even be invited to join the YouTube Partner Program. You have to apply to get in, but once you do, you’ll start earning income right away (on the videos you’ve chosen to monetize). 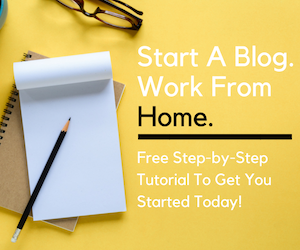 If I can start a blog and make passive income online, you can too. In fact, many bloggers make most of their income passively. Affiliate marketing and ad sales are (probably) the two most popular residual ways bloggers earn month after month. And while it may take a little bit of time to get earnings rolling in, once you do, it can be pretty substantial. Take a look at Michelle over at Making Sense of Cents. Her popular finance blog routinely earns $100,000 each month — often in passive income! Making passive income online as a blogger all starts with a niche. Again, the big-money makers are often related to finance, relationships, fitness, and food. But don’t be afraid to think outside of the box, either. You don’t need a large audience to make money, just a specific one that you can monetize. We know bloggers use a combination of revenue sources to make passive income online each month. If you decide to start a blog, you may prefer certain methods of monetization over others. And that’s okay. You need to find what feels right to you and focus on the those revenue streams that pay off the most. Recommend products on Amazon and earn a commission on each sale. There are also special bounties that pay a flat-rate for each conversion, i.e., someone signs up for a Prime membership trial using your link and you earn $5. With millions of products to choose from, you can use Amazon Associates program to monetize just about any blog. Your earnings are paid out once monthly. As a Media.net publisher, your blog will display Yahoo contextual ads. 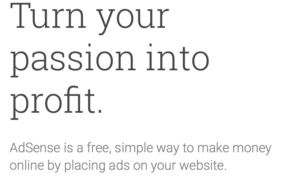 Anytime someone clicks on an ad from your site, you receive a payout. You can customize the look of ads to complement your blog’s design, not overwhelm it. Advertisers sign up on Commission Junction to manage their affiliate programs and open them up to publishers, like you. There are programs for all types of services, stores, and products. So, chances are, you can find plenty of programs that would work for your niche. Google Adsense is one of the most popular platforms to display ads on websites. And it’s the one I use the most here on Work From Home Happiness. Ads are customizable so they never overwhelm your blog’s content. And the analytics are great in helping to optimize ad placement so you can make adjustment to help increase your passive income earnings! Few people make money online overnight. But with a little patience and a lot of tenacity you too can make passive income online, even if you’ve never earned a single buck online before. P.S. This post contains affiliate links. What are they? Check out my disclosure statement for more info. Passive income is a too often overlooked option. Thank you so much for these great ideas! Almost none of these are examples of “passive” income.